1983-08-09. New. Ships with Tracking Number! INTERNATIONAL WORLDWIDE Shipping available. Buy with confidence, excellent customer service! 1990-06-03. New. Ships with Tracking Number! INTERNATIONAL WORLDWIDE Shipping available. Buy with confidence, excellent customer service! Philadelphia: J.B. Lippincott, 1960. First Edition, First Printing. Cloth. Very Good/Very Good in Archival Plastic. 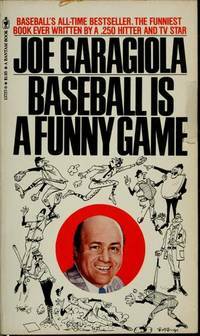 First Edition in original dustjacket, Inscribed by Garagiola on the front free to Emil "Buzzy" Bavasi: "To my friend Buzzy - I just hope that somewhere in this book you will read something that will put the same expression on your face that the last out does when the Dodges win. Joe Garagiola (Yogi's Friend)." Bavasi was general manager of the Brooklyn and Los Angeles Dodgers from 1951-1968. Jacket lightly worn; slight lean to spine; otherwise near fine. 1960. Book. Very Good. Hardcover. Inscribed by Author(s). 1st Edition. 8vo - over 7¾ - 9¾" tall. First edition, stated 1960. Inscribed and signed by Joe Garagiola, book has no other marks. no tears, a bit of cornering. Dust jacket, original price evident on fold down, has some edging and cornering, two verso closed tears at back, a small stain at back. A very good first edition in a good dust jacket..
1983-08-09. Good. Ships with Tracking Number! INTERNATIONAL WORLDWIDE Shipping available. May not contain Access Codes or Supplements. May be ex-library. Shipping & Handling by region. Buy with confidence, excellent customer service! Bantam. Used - Good. Good condition. Short gifter's inscription on inside. Bantam, 1983-04-01. Mass Market Paperback. Used:Good. 1990-06-03. Good. Ships with Tracking Number! INTERNATIONAL WORLDWIDE Shipping available. May not contain Access Codes or Supplements. May be ex-library. Shipping & Handling by region. Buy with confidence, excellent customer service! Lippincott, 1960. Book. Near Fine. Hardcover. Signed by Author(s). Signed with inscription by Joe Garagiola. With name stickers pasted on front endpage. Clean copy in bright as new covers. Layer of surface loss at top of endpage from old erasure. Bright jacket with some light wear. 12th impression. Benefits the Friends of the Albany, Ca library. .
Bantam. MASS MARKET PAPERBACK. 0553235664 New Condition. . New. HarperCollins. PAPERBACK. 0060916729 New Condition. . New. Philadelphia: J.B. Lippincott Company, 1960. First Edition. Hardcover. Good/Fair. SIGNED. 1st Edition. Hardcover with dustjacket. Cover clean with minor shelfwear. Interior clean, binding tight. Jacket rubbed with small tears in top and bottom of spine and bumped corners and edges.Your purchase benefits literacy and summer reading programs in Cincinnati and Hamilton County, Ohio. We ship every business day. All books ship in cardboard bookfolds with delivery confirmation. Bantam Books, 1980-01-01. Mass Market Paperback. Good. Bantam, 1983. MInor shelfwear - a nice copy.. Mass Market Paperback. Very Good. Bantam. MASS MARKET PAPERBACK. 0553235664 Like New Condition. . Fine. HarperCollins. PAPERBACK. 0060916729 Like New Condition. . Fine. Lippincott. Very Good in Good dust jacket. 1960. Hardcover. Books is very nice, dustjacket looks attractive except for tears at fold-over; 8.10 X 5.60 X 0.90 inches; 192 pages . J. B. Lippincott, 1960. HBDJ, DJ corners & spine rub,1960, VG/VG-, 4th printing, . Hard Cover. Lippincott. Very Good with no dust jacket. 1960. First Edition; First Impression. Hardcover. Signed on endpaper "Best Regards, Joe Garagiola". Also former owners name in front of book. Joseph Henry Garagiola Sr. (February 12, 1926 March 23, 2016) was an American professional baseball catcher, later an announcer and television host, popular for his colorful personality. Garagiola played nine seasons in Major League Baseball (MLB) for the St. Louis Cardinals, Pittsburgh Pirates, Chicago Cubs, and New York Giants. He was later well known outside baseball for having been one of the regular panelists on The Today Show for many years and for his numerous appearances on game shows as a host and panelist. (Wiki) ; 192 pages; Signed by Author . Lippincott, 1960-01-01. Hardcover. Good. 8.1000 inches 5.6000 inches. Inscribed by author. Brodart cover, edge wear to dust jacket. Philadelphia: Lippencott, 1960 Book has very light age toning to top paper edges, light wear to bottom edge of spine. DJ has a few small, short tears to top edge of DJ spine 1/16"-1/8" (3), 4 corners of DJ are lightly knicked, thin line of rubbing on bottom edge of DJ spine. 192pp. Light green cloth. Tight, square, bright copy with firm corners. No remainder mark. No internal names, notes, markings. Crisp, unclipped pictorial DJ in Mylar cover ($4.50) on bottom corner of front flap - Arthur Daley blurb on rear panel of DJ praising the book. No statement of Edition on Copyright Page or Title Page. No blind stamp on rear board of book ???? Lippincott listed later printings on Copyright Page during the '50's & '60's. Most likely a 1st due to price on DJ and lack of blind stamp. USPS Tracking provided. H. Cloth. Almost Fine/Almost Fine. 8vo - over 7¾" - 9¾" tall. Baseball. Philadelphia: J.B. Lippencott Company, 1960 "Here's the straight dope from the man who never forgets that almost every situation on the diamond has a laugh in it somewhere." Condition notes - 192 numbered pp; HB w/DJ. Pages: clean, bright, tight; sm faint smudge f.e.. Cover: orange, green titles front/spine; no shelfwear. DJ: unclipped, green, Garagiola front, white/orange titles front/spine; modest edge/shelfwear, several tiny closed tears, spine mildly faded, slight rubbing. US: Bantam, 1983. Bantam 1983 Near Fine/ Bantam 1983 / Unread. Corner crease to back cover o/w Fine. Tight tanned pages.. Mass Market Paperback. Near Fine. J.B. Lippincott, 1960. VG+ in good+ edge rubbed dj.Text is clean and tight.. Fourth Printing. Hard Cover. Very Good +/Good +. Lippincott, 1960 Good condition. Text is clean, binding firm. DJ is good with a short rip to back of cover, else good. Nice copy..
5th or later Printing. Hardcover. Very Good Plus/Somewhat Worn Dust Jacket. A VERY GOOD PLUS Hardcover in somewhat worn dust jacket. Later printing. NO marks or underlining. This item is IMMEDIATELY AVAILABLE. British Penguin Books, 1987, 11th printing, British crime vintage paperback, a collection of stories of Engalnd's best known barrister, nice copy, minor wear to spine and edges, still near VG+. Philadelphia: J. B. Lippincott Co., 1960. Orange boards are lightly rubbed on edges. Pages are clean, text has no markings, binding is sound. . Seventeenth Printing. Hard Cover. Good/No Jacket. 8vo - over 7¾" - 9¾" tall. J.B. LIPPENCOTT, 1960. Book. Good. Hardcover. LATER PRINT. 8vo - over 7¾" - 9¾" tall. 192 PAGES. HARDCOVER BOOK WITH GREEN DUST JACKET RUBBED. LIGHT SOILING TO REAR END PAPER. DUST JACKET HAS BEEN TAPED TO INSIDE BOARDS. LIBRARY OF CONGRESS NO. 60-7438. J.B. LIPPENCOTT. 1960, LATER PRINT. 8vo - over 7¾" - 9¾" tall. N.Y.: Lippincott, 1960. Hard Cover. Very Good +/Very Good. Later. DJ rubbed, esp at corners and top edge. Joe is a FUNNY guy !. BASEBALL, PLAYER, CATCHER, YANKEES, NEW YORK SPORTS. Catalogs: Sports. Bantam Books, 1962. Softcover. In good condition with yellowed pages, damage to the spine, and wear to the cover.. Baseball's All-Time Bestseller! Condition: In good condition with yellowed pages, damage to the spine, and wear to the cover. New York: Bantam, 1962. Sports. Bantam J2383. 3rd printing. Paperback. 40 cent cover. Previous owner name on inside cover is blacked out. The interior otherwise clean. NO crease lines. Minor edgewear, with a tiny nick on top edge of front panel. VG+.. Soft Cover. Very Good+. Seller: Second Hand Prose, Inc.
Bantam, 1983-04-01. Mass Market Paperback. Good. J. B. Lippincott. Very Good in Very Good dust jacket. 1960. Later Printing. Hardcover. Bantam Books. Used - Good. Ships from the UK. Former Library book. Shows some signs of wear, and may have some markings on the inside. 100% Money Back Guarantee. Your purchase also supports literacy charities. Bantam. Used - Good. Ships from the UK. Shows some signs of wear, and may have some markings on the inside. 100% Money Back Guarantee. Your purchase also supports literacy charities. bantam books. Used - Good. Good condition. Lippincott. Used - Acceptable. Shows definite wear, and perhaps considerable marking on inside. Bantam. Used - Good. Shows some signs of wear, and may have some markings on the inside. Lippincott. Used - Good. Shows some signs of wear, and may have some markings on the inside. Bantam. Used - Very Good. Great condition for a used book! Minimal wear. Harpercollins. Used - Good. Good condition. Slightly dampstained. Bantam Books. Used - Very Good. Very Good condition. Bantam. Used - Good. Good condition.